Can you give free product voucher as a reward? Yes! 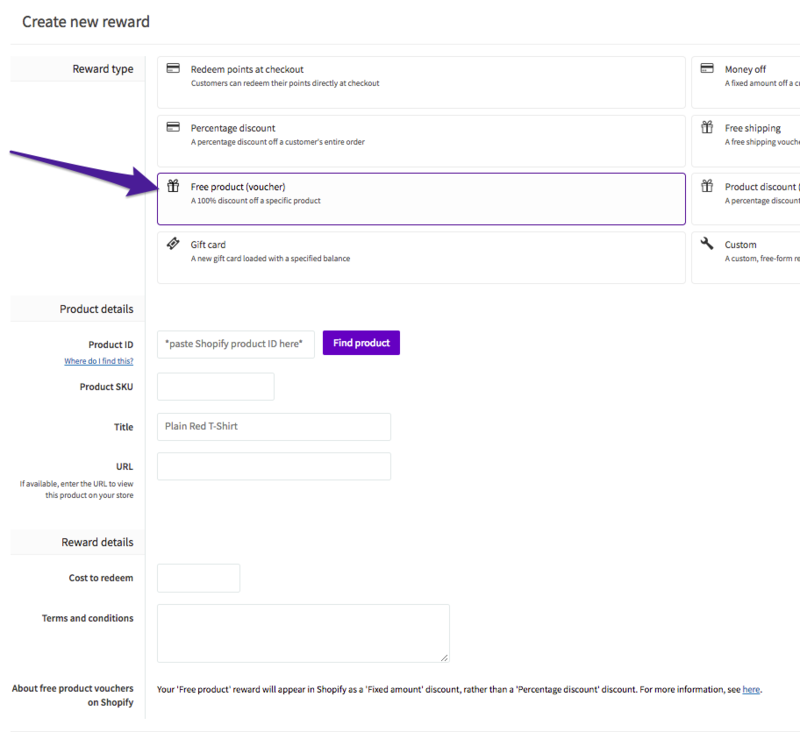 You can now provide your customers with a specific product using the 'Free product' reward. *SKU = Stock Keeping Unit, is a number assigned to a product by the company for stock-keeping purposes and internal operations. This is a product voucher so it can be added to checkout without anything else in the cart. When the reward is originally claimed, we add the correct product to the customer's cart for them. However, if they don't check out then, but come back later, their cart may have been cleared. They have to add the product to their cart and use their discount code. Can I create a reward that is a percentage of the product so that it isn't free? Yes! Choose the 'Product discount' reward, enter the Product ID and choose a variant if prompted, then enter a discount amount. I looked at my new reward in Shopify and it says it is a 'Fixed amount' discount, why? Your 'Free product' and 'Product discount' rewards will appear in Shopify as 'Fixed amount' discounts, rather than 'Percentage discount' discounts because Shopify applies the percentage discount to all items in a customer's cart that match a Product ID, as opposed to just one. Hence, to match expected behaviour - of discounts only applying to one item - we save the reward as a 'Fixed amount' discount that matches the particular percentage discount. Can I choose multiple variants for the same reward? No, currently you can only choose one variant per reward.